Dharamsala, July 17: A senior Chinese official has stated that China is willing to talk to the Dalai Lama about his future and that of some of his supporters but not that of Tibet, according to media reports. "The central government will never discuss the future of Tibet with the Dalai Lama," Dong Yunhu, the new director general of the information office of the Sate Council, China’s Cabinet, said Tuesday. "What we can discuss with him is his future and that of some of his supporters. ""I don't think he is qualified to represent Tibet. If he ever did, it was before 1959," Dong was quoted as saying. "They deny that Tibet is an inalienable part of China and demand autonomy for 'Greater Tibet'. It means the Dalai Lama should rule all the land inhabited by Tibetans, nearly one-fourth of China, and Han Chinese should be moved out of those areas," Dong added, saying that this was a position that was not acceptable to China. The exiled Tibetan leader and Tibetan people refute such assertions from the Chinese government.Thousands of Tibetans followed their leader the Dalai Lama into exile to take refuge in India in 1959 after a failed uprising against continuing Communist Chinese regime's oppression in their homeland. Since then the Dalai Lama has been heading the Tibetan Government-in-exile from the Indian hill station of Dharamsala to restore Tibetan people’s freedom.Lately the Dalai Lama has advocated a "middle way approach" calling for a “real and meaningful” autonomy for Tibet within the framework of Chinese Constitution, a broad compromise many young Tibetans are not happy about.The Dalai Lama maintains it is one of his commitments to carry on the “responsibility to act as the free spokesperson of the Tibetans in their struggle for justice” and that it will “cease to exist once a mutually beneficial solution is reached between the Tibetans and Chinese”.For him Tibet issue is about the welfare of the Tibetan people and not about the fate of his own personal status and affairs or that of the Tibetans in exile. The political leadership of the Tibetan Diaspora has been directly elected by the general Tibetan populace and the Dalai Lama often describes his present role as more of a “semi-retired” one. 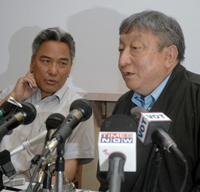 He has also clearly and openly stated that he would immediately renounce all legitimate political authority vested in him once real and meaningful freedom would be restored for Tibetan people.Seven rounds of talks between the Dalai Lama's representatives and that of the Chinese government, started since 2002, did not make any significant breakthrough. The latest seventh round of talks held in Beijing between July 1 and 2 was the first formal round of talks between the two sides after widespread unrest broke out in Tibet in March in which Tibetans in Tibet protested against Chinese rule and demanded the return of the Dalai Lama to Tibet. The talks, however, made no headway on the status of Tibet as expected by the Tibetan leadership, forcing a senior Tibetan envoy to describe the outcome as “disappointing”. "I personally told my Chinese counterparts very candidly that if the talks do not make any tangible results, there is no point in wasting each other’s time," Mr Lodi Gyari, the Dalai Lama’s Special Envoy, told reporters in Dharamsala following the two-day talks with Chinese counterparts.Nevertheless, the two sides have at least agreed to meet again later in October, once the Beijing Olympic Games would be far over.Many world leaders have routinely insisted China to hold result-orientated dialogue with the exiled Tibetan spiritual leader.China Thursday made a more conflicting statement saying it was “sincere” about Tibet talks, rejecting accusations by a representative of the Dalai Lama that it was not serious about talks over the status of Tibet. "The central government is sincere about holding contact with the Dalai side," foreign ministry spokesman Liu Jianchao reportedly told reporters in Beijing.Liu was reacting to statement made by Kelsang Gyaltsen, an envoy of the Dalai Lama, on Tuesday at the European Parliament in Brussels. Mr Kelsang said, “We do not see any useful purpose in continuing the dialogue since there is obviously a lack of political will from the Chinese leadership to seriously address the issue of Tibet." Although the Tibetan leader has repeatedly and publicly stated he is not seeking separation and independence of Tibet, China continues to vilify him as a “separatist” seeking Tibet's independence.The Dalai Lama was awarded the Nobel Peace Prize in 1989 for his relentless non-violent movement for the peaceful resolution of Tibet's issue through dialogue with the Chinese leadership.